You can create a copy of an existing project or task with a single click. Any project or task can serve as a project or task template. Cloning works as a "smart copy" - it will duplicate all the project/task properties, including the team, and will automatically adjust the dates (in relation to the current date) and the status (it will set it to "open"). When cloning projects you have two options - to include or not to include all the sub-tasks. 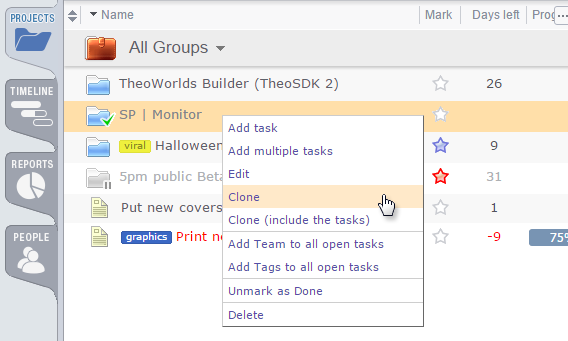 Right click on any project/task in the left panel to access this feature.